Anyone familiar with Linux is probably familiar with virtual desktops. If you're not, download VirtuaWin and take a look. This utility takes your Windows desktop, clones it up to nineteen times, then lets you switch between them. The idea is to keep a set of related programs or documents on each desktop to help organize things for people who leave lots of applications and documents open. The stark setup dialog is indicative of using VirtuaWin, which is easy--once you know it. VirtuaWin sits in the system tray where you access most functions, including the ability to define and switch between virtual desktops by right-clicking the little square VirtuaWin icon. You may also switch between desktops using hot keys, defined by default as Ctrl + Alt plus an arrow key. 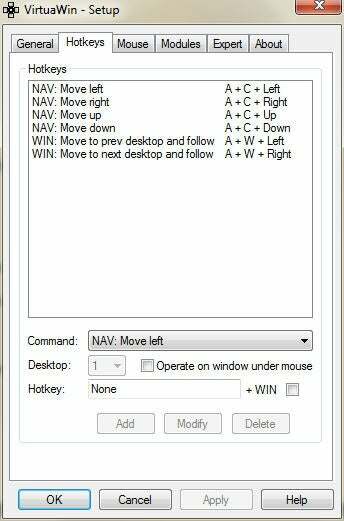 The left mouse button is used to move directly to, or bring to the current desktop currently open applications and documents. You may have up to 20 desktops, but practically speaking most users will only create a few. Learning how to use VirtuWin isn't as easy as it could be--the developers don't seem to have spent a lot of time putting themselves in a new user's shoes. For instance, open the setup dialog, select the Hotkeys tab and a hotkey entry will read something like NAV: A + C + Left. An experienced user will know that the A and C must mean Alt and Ctrl, as well as W meaning the Windows key--a key lacking from many, many keyboards. However, a new user might sit there pressing the alpha keys wondering what they were doing wrong. There are also rules for Windows, which will be of interest only to techies with programming experience. Steep learning curve aside, VirtuaWin works great and--for some--will work organizational wonders. If you're interested in virtual desktops, give it a whirl. Manage your virtual desktops with this open source utility.